Residents of the Short North, jazz aficionados and all those looking to extend their summer picnic season have cause for jubilation: the creation of the Harrison West Jazz Series. This new free outdoor concert series will kick off at the gazebo in Harrison Park in the Harrison West neighborhood on Sunday, September 8 from 1:00- 2:30 p.m. and continue on consecutive Sundays through September. The Harrison West Jazz Stage is the creative concept of two Harrison West residents, Dara Schwartz and Mark Subel. 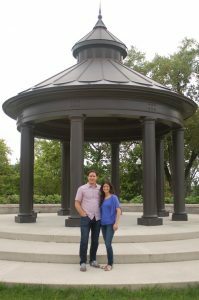 The couple was excited by the plans for Harrison Park and the gazebo and began thinking about how they could ultimately utilize the space to enrich the community. Mark is an avid jazz fan (and founder of JazzColumbus.com) and given the rich history of jazz in Columbus, combined with the abundance of local jazz talent, the launch of a neighborhood-based jazz series made perfect sense. The goal of the duo is to spread enthusiasm for and awareness of Columbus Jazz, while helping to enhance and unite the Harrison West neighborhood. The scheduled concerts represent diverse genres of jazz that are sure to entertain. For event details, please visit: https://www.facebook.com/HarrisonWestJazzStage. The Harrison West Jazz Stage is a free jazz concert series held on Sunday afternoons in September from 1:00-2:30 p.m. in the Harrison Park Gazebo (at the corner of Harrison Park Place and First Avenue.) This all-volunteer concert series was founded by Harrison West residents Mark Subel and Dara Schwartz in January 2013. It is designed to build awareness of the local Columbus jazz talent and to spread the spirit and enthusiasm for Columbus arts, through community, while celebrating the Harrison West neighborhood. The Harrison West Jazz Stage is sponsored by Ken Wightman of Prudential Realty Center, the Harrison West Society, Integrated Building Systems, Ohio Alliance for Arts Education and Wagenbrenner Development. Additional support is provided by Jazz Arts Group and Short North Foundation. Next post: Dan White Sextet Releases New Album, "Play"